Explorer Amos Burg converted this 26 foot rowing rescue craft for use in his 1933-34 National Geographic-sponsored expedition to Cape Horn ("Inside Cape Horn", National Geographic 1937: 743-784. By Amos Burg) with crewmember Roy Pepper. Lovingly restored in the 1990s by Bruce Garman, Ed Louchard, and Steve Chapin of Point Hudson Shipwrights, she now resides with Port Townsend's Wooden Boat Foundation and is a favorite choice of kids for their youth sail training programs. 1937 Burg's Cape Horn expedition published in National Geographic. 1950 Burg and Andrew Yunker rescue Dorjun from mudflat. Carefully stored at Yunker home for almost 40 years. 1988 Bruce Garman buys Dorjun for $1 from Yunker (his father-in-law) and begins extensive rebuild and restoration with shipwrights Steve Chapin and Ed Louchard of Point Hudson Boatyard. 1992 Restoration completed; Dorjun re-launched, a highlight of the Wooden Boat Festival; re-christening by Burgs widow Carolyn. 1996 Bruce Garman donates Dorjun to the Wooden Boat Foundation/Northwest Maritime Center. 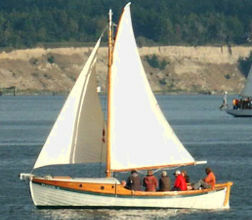 Dorjun continues to serve as a training boat is a favorite of sailing students in the Northwest Maritime Centers education programs.